Achieving differentiation in the SERP's is something that all websites strive for. An eye catching advert can increase the quality of traffic and reduce the necessity to pay the highest costs per click. As paid search reaches a certain level of maturity, advertisers are gradually reaching a limit to how relevant and appealing they can make the 130 characters afforded to them in a Google PPC ad. As advertisers and agencies increasingly adopt best practice, it is much harder to achieve standout from the SERP's. Take this search on all inclusive holidays on Google. Every paid advert has exactly the same title. The same principles have been applied to each advert. The title consists of the keyword, as does the text within the advert and wherever possible, the display URL. In my opinion, an advert has a very small amount of time to capture a users attention. Obtaining the referral from a competitive and relevant search term is imperative to getting the embark upon the purchase cycle. Some organisations have tested various creative styles. Arrow ads have been proven by some organisations to improve click through rates. There are also some more creative examples using Ascii text. In the US, Yahoo! has already experimented with the use of images in adverts in order to allow advertisers a means of differentiating their results but in truth differentiation is becoming increasingly difficult. Therefore, I am surprised at slow uptake of Google Checkout in the UK. Google Checkout affords adwords advertisers a Checkout Logo below their listing. The checkout logo stands out from the page making the decision as to which advertiser to click on far simpler for GC users. 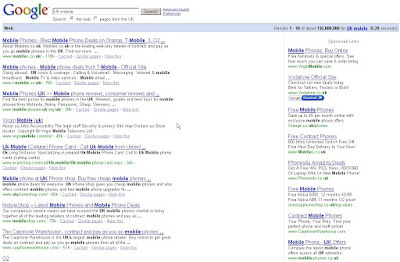 In this example, the Vodafone advert stands out clearly on what is a very competitive search term. This means that the advertiser does not have to pay to be in the top position. Although a number of smaller retailers have implemented Google Checkout on their site, the only notable organisations to adopt are Dabs and Vodafone. There have been reports that GC does not mix well with Affiliate Marketing but there are far more advantages to advertisers. Google advertise the benefits to an Adwords campaign as one of the main benefits of adopting the Checkout facility. 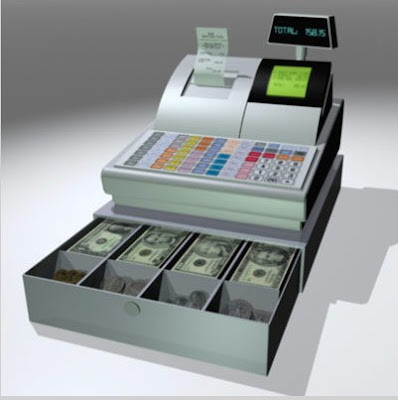 Other benefits include free transaction processing and free fraud protection. Some pundits in the US have even pointed that use the of the Google Checkout logo in the SERP's provides the listed organisations with an unfair advantage over competitors. According to Hitwise, during the key pre-Christmas shopping period, Google Checkout overtook PayPal as the most visited alternative payment provider for the first time. However, these figures do not compare to the US where alternative payment methods have grown significantly in popularity over the past twelve months. So why has this not been the case in the UK? Is the UK consumer slightly more apprehensive about supplying their payment details to an independent provider? Or is the online retail market so dominated by affiliate marketing organisations that are generally opposed to it's use. The growth in adoption is cyclical. Advertisers will not look to adopt until there is a proven market of prospects with a greater inclination to purchase. Consumers will not adopt until there are greater incentives to do so. eBay virtually forces customers down the PayPal route but there is no GC equivalent. For me, as an advertiser that invests heavily in paid search marketing, Google checkout is good value simply for it's ability to provide differentiation in the SERP's. Only once the cyclical adoption model gathers momentum will advertisers truly realise it's potential. I anticipate a scramble to adopt later this year and that by next Christmas, the gap between between GC and Paypal will be even more significant.